The picturesque towns of Bodega and Bodega Bay, along the Pacific Coast Highway about 70 miles north of San Francisco, are famous as the location of The Birds, Alfred Hitchcock’s 1963 horror movie. Visitors coming to photograph the movie’s featured Potter School often overlook a nearby expression of gratitude following a different kind of horror. The Italian public was so touched by the Greens’ act of kindness in the face of grievous loss that families, individuals, schools and churches began sending bells to the family as expressions of gratitude. A large bell was sent by the Marinelli Foundry in Agnone, Italy, which has been making bells for the Pope for more than 1000 years and is one of the three oldest family businesses in the world. The bell, blessed by Pope John Paul II, includes the names of the recipients of Nicholas’ organs. 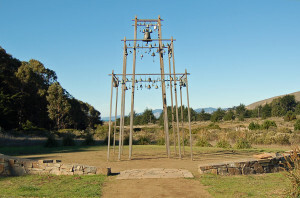 San Francisco sculpture Bruce Hasson assembled the 140 bells onto a wooden frame along Highway 1 just north of Bodega Bay. Called “The Children’s Bell Tower,” the memorial honors Nicholas Green and all the children of the world whose lives have been cut short by violence. It also gives thanks to the generosity of the Green family, who recognized that the tragic death of their son could give others a chance for a better life.